The term 'Pelasgian' (or Pelasgoi) was used by the Classical Greeks to denote pre-Hellenic peoples in Greece, Crete and beyond. They spoke a language or languages which were identifiably non-Greek at the time. Traditionally they were thought of as peoples who pre-dated the Mycenaeans throughout a large part of Greece, these parts generally being in the east of the country which had been attributed to speakers of ancient East Greek, otherwise known as Ionians. They were already identifiable by the time of the Trojan War, when several contingents fought in support of Troy. By the Classical period various enclaves of Pelasgians could be found in Greece, the Aegean islands and western Anatolia. To date, the question of whether the Pelasgians really were pre-Mycenaean Greeks, or were related to them in some way, has not been answered. Various studies have been conducted to try and find identifiable non-Indo-European language elements, while some archaeological digs (notably on Lemnos) identify weaponry which is clearly different from that of the Classical Greeks, but which preserves many elements of Mycenaean weaponry. A possible conclusion is that the native Pelasgians were heavily influenced by the Mycenaeans, but not necessarily part of their culture. The city of Pavlopetri is founded on the south-eastern coastal tip of the Peloponnese, in southern Laconia. Pavlopetri's inhabitants later copy Cretan and mainland styles, making exact ceramic copies of high status Cretan bronze jugs, in effect making cheap copies of expensive exotic goods in much the same way that desirable designer brands are copied today. But the early city is neither a Minoan colony or a Mycenaean settlement - it predates both peoples in the area, making it more likely to be a Pelasgian settlement that is later absorbed by the Mycenaeans and is subject to heavy Minoan influence or control in the second millennium BC. 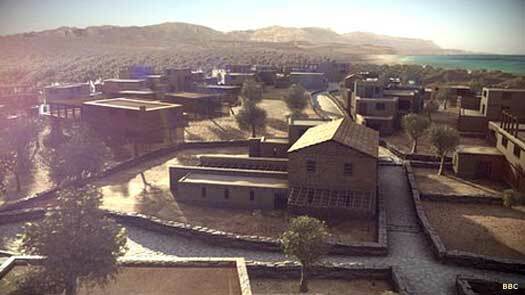 The city flourishes, reaching a peak around 2000 BC, by which time it is certainly a Mycenaean city. Eponymous ancestor of Pelasgoi. Father of Lycaon of Arcadia. The descendants of Pelasgos are claimed by Hellicanus of Lesbos as the kings of Pelasgiotis in Thessaly. Pelasgos also has a son named Lycaon, who becomes the ruler of Arcadia. He has four sons of his own: Iapyx, Daunius, Oenotrus, and Peucetius. They lead their people across the Adriatic Sea from Illyria into south-western Italy, where they settle, mixing in with the native population which is probably formed of Italics. The main group fragments into at least five segments: the Dauni, Iapyges, Messapii, Oenotri, and Peucetii. Ancient authors also suggest a similar origin for the Itali, Morgetes, and Siculi. Son of Pelasgos and Menippe. First king of Pelasgiotis? Son. Last Pelasgian king of Pelasgiotis. Hellicanus of Lesbos writes for a fifth century BC audience that the Pelasgian subjects of Nasas, king of Pelasgiotis in Thessaly, rise up against the Hellenes, suggesting the latter have conquered Thessaly and made Nasas a vassal. The Pelasgians depart for Italy where they take Crotona and subsequently found Tyrrhenia, placing them as ancestors of the Etruscans. Although this is unlikely, the possibility exists that the Pelasgians settle alongside and are later absorbed by the Etruscans. There are clearly many other Pelasgian populations around Greece and the Aegean. Herodotus mentions those who remain 'above the Tyrrheni in the city of Creston', and others who formerly inhabited Placia and Scylace on the Hellespont. These latter two 'came to live among the Athenians' as the Cranai, although they clearly retain their own language at the time. They are later resettled by the Athenians on Lemnos, come to be known as the Hellespontine Pelasgians, and have to be reconquered by Athens. The Ionians of the Peloponnesus are known as the Aegialian Pelasgians. Many other towns with Pelasgian residents and names are later renamed by Hellenic newcomers, including those on Lemnos and Imbros, and perhaps Corinth too. Larissa is a common name for Pelasgian towns or cities wherever they settle. There are examples in Argos, on the border of the plain of the Caystrus, in Cuma, the territory of Ephesus, near Tralles (which itself is a Pelasgian town), in Thessaly, the Troad, and Lesbos itself is so thoroughly Pelasgian that it is even known as Pelasgia (according to Strabo). As Mycenae declares war on Troy, Priam of Troy musters his allies. These include contingents of Pelasgians from several locations in western Anatolia including Larissa. Some Pelasgian colonies still exist, especially it seems in Arcadia in the Peloponnese. Another territory on the north-western Aegean coast is Pelasgiotis, which lies immediately to the south of Pieria, which itself is conquered around 500 BC by the growing Macedonian kingdom. However, from this date onwards, the Pelasgians are gradually absorbed into the general Greek population.